You are any woman who may chance to read this page – high school student, college student, teacher, clerk, computer operator or secretary. Have you ever really considered how you are using the talents God gave you? Have you ever thought of giving them back to Him by consecrating your life to His service? Do you wonder? We are told that God calls many, for there is much of His work to be done. Listen, do you hear His gentle call, “Come follow Me!”? Some resist His call, others think they are not holy enough – failing to understand that religious are not perfect, but STRIVE for perfection. God may not tap you on the shoulder or send an Angel to whisper in your ear, but realize, if you will, that God has many ways of letting you know His will for you. Discernment: Establishing a relationship with Community. • Guided experience of prayer, community and service with the Directors of Formation. • Admitted to candidacy by Mother General with the consent of the council. • Program is duration of six months but no longer than a year. • Period of time to provide a gradual transition from the lay life to religious life. • Time for both candidate and congregation to assess her suitability for the life and apostolate of the community and the genuineness of her vocation. • Admitted to the novitiate for a period of two years. • Formation period of two years. Consists of a year of canonical studies and a year of training in the community apostolate. • Temporary vows of chastity, poverty and obedience for three years and no more than six years. • During this time, the sister is guided in her personal, spiritual and communal development. • Integration of spiritual life with ministry. 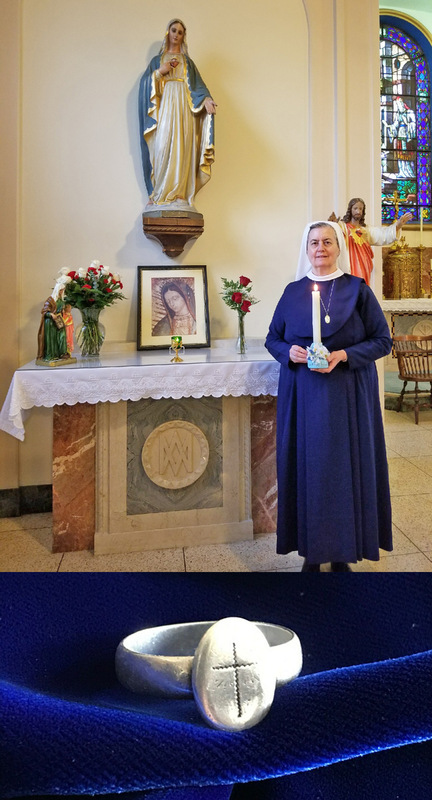 • A sister’s desire for Perpetual vows of poverty, charity, obedience and the charitable instruction of poor children. • A Perpetual professed sister shares mutual responsibility for the life and mission in the congregation. • At the time of Perpetual profession, a sister is given a ring.